Berries that linger well into winter are lovely to behold. Such BBG specimens as the crabapples in the Osborne Garden, the American holly in the Native Flora Garden and the winterberries outside the Steinhardt Conservatory are highlights of a winter visit. But why exactly have these plants developed this characteristic? After all, the vast majority of fruiting trees and shrubs reproduce just fine by sticking to the more familiar timeline, producing fruits that ripen in warm months and drop or get eaten soon after. Maybe it’s helpful to arrive fashionably late sometimes. The fruits of the native hollies, like American holly (Ilex opaca) and winterberry (Ilex verticillata), ripen late and are what ecologists call poor-quality fruits. They don’t contain a lot of nutrients (they especially lack fats and oils). They also contain some compounds that can make them taste bad to the birds. Most fruits produce these bad tasting compounds; they are what keeps animals from eating fruits until they are ripe. Usually the compounds break down and are gone by the time the fruit ripens, but in the hollies it takes longer for them to fully break down. So they’re not eaten by migrating birds; they prefer fruits packed with sugars, fats, and oils that provide energy for their flights. Plus, holly berries still don’t taste very good during the fall, during migration. But the bad tasting compounds do slowly break down, and the fruits get gradually get more palatable. At the same time, winter wears on, and winter birds must take whatever food is available, even if it’s not very nutritious. At some point, the holly berries start to look pretty good and the birds willingly eat them. No one knows for sure what purpose this alternate timeline serves the holly plants, but there are a few good ideas. Since so many other plants ripen their fruits in time for migration, the hollies avoid competition by waiting longer. It also takes energy and resources to make highly nutritious fruits. By waiting until the birds are a little less choosy, hollies get their seeds dispersed without having to put all that energy into reproduction. That energy can then be used for growth or to fight of diseases and whatever other work the plant does to survive and propagate. Crabapples are similar in a lot of ways. Many of them also have poor-tasting, low-nutrient fruits with big seeds packed full of cyanide. Originally, some species probably evolved to ripen late for the same reasons that native hollies did. Most of the winter fruiting crabapples that you see around now are cultivated, though. They may be grown in areas where there aren’t a lot of animals to disperse them, but people have been happy to give a helping hand since they provide winter interest so nicely. It’s interesting to think of the late-fruiting and enduring holly berries from the perspective of the plants—“hollies get their seeds dispersed without having to put all that energy into reproduction.” But you could just as easily see it from the birds’ perspective—how nice to have some berries around in the middle of winter, when seeds have been foraged and eaten already, insects hidden away to overwinter, and the ground covered in snow. Those hollies look mighty appetizing, sweetened by the freezing temperatures, and the birds get something to hold them over a little longer. As usually seen in nature, there’s a nice symbiosis in which both the birds and the hollies win. And we win because we get to watch it all play out. why do some Ilex winterberries have berries to the tip of the branch and others have a long bare tip? Is this a cultivar difference? If so, what is the name of the first? 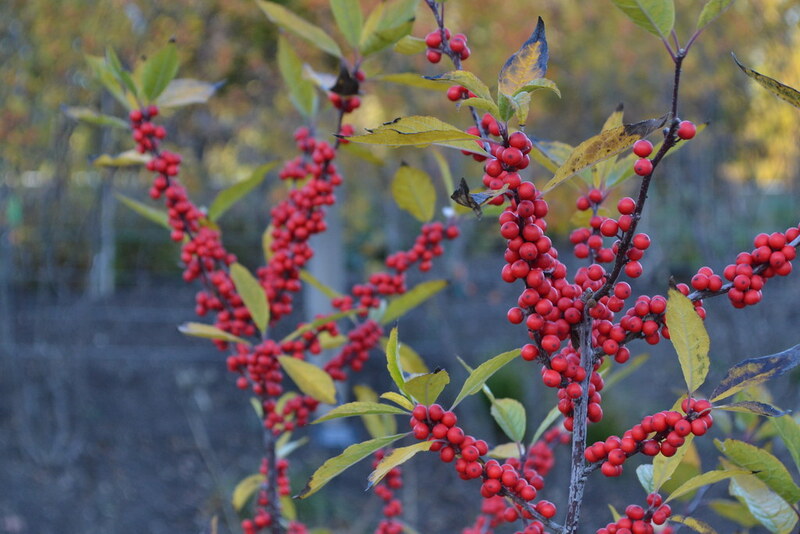 Ilex verticillata ‘Winter Red’ (winterberry), in the new Discovery Garden. Photo by Lee Patrick.